Don’t hesitate to contact me for more information, or to ask for the materials if you want to try this out yourself! Development Monopoly is a simulation game that makes players experience how power relations influence the agency of different socioeconomic groups, and how this can induce poverty and inequality. 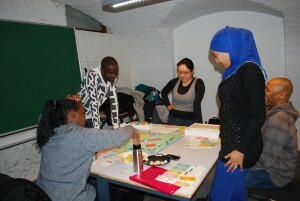 Players alter the original rules of the Monopoly board game in order that they would more accurately reflect social stratification and inequalities in the context of developing countries. After the game, the players reflect on how the rules could be made more inclusive and pro-poor. In an individual debriefing, they are invited to think about the connections between game dynamics and contemporary evolutions in developing countries. In a final collective debriefing phase, participants discuss the ways in which the simulation experiences enhanced their understandings of poverty and inequality. Development Monopoly was conceived by An Ansoms (UCL) and Sara Geenen in 2008-2009. Here you find some pictures of IOB master students playing the game. A ready-to-use guide for playing the game is available and an analysis of its learning effects has been published in the journal Simulation and Gaming. Land Rush is a game that simulates the complex reality of access to, and management of, natural resources in developing countries. Over the past decade, developing countries have experienced an increased process of commercialisation of natural resources, and especially of land. This has lately been framed as the process of land grabbing: the acquisition of land by private and/or public investors with the aim of producing food crops, crops for biofuels or to provide land for growing urban areas. Next to foreign investors, local elites and influential groups may also join the scramble for land and natural resources. However, this does not have the same effects on everyone! Rural dwellers in Africa, Asia and Latin-America may be more or less poor and more or less powerful. In this exercise we simulate a negotiation process between the multinational company, local authorities and the local population in and around a new mining concession. Each participant takes up the role of one of the actors in the process, and receives a detailed individual role description. The eventual aim of the exercise is to design a Protocol of Understanding between the different parties on the issue of resettlement and compensation and local development. The Protocol should contain some general guidelines and some more specific provisions on how to resettle and compensate, and how to implement local development programmes. This simulation game has been played by IOB master students and by Congolese students of the master programme in Development Studies and Public Administration at the Catholic University of Bukavu. Since 2009 we organize a simulation game/ role play in the Master Governance and Development (IOB) on the conflict in the Great Lakes Region. Students get a scenario, which is partly based on facts, partly fictitious, and they are assigned the role of one of the (real) actors in the conflict in the eastern Democratic Republic of Congo. The simulation stimulates them to analyze the current situation in the region, to take a stance on some important issues – with which they personally do not necessarily agree -, to formulate arguments and communicate them in bilateral and plenary meetings. In 2010 students made this report of the conference. An important disclaimer to be made is that this simulation, though based on real-life events, leaves room for personal interpretation, creativity, and fiction.